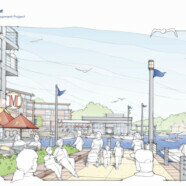 Monona waterfront redevelopment moves forward | Vandewalle & Associates, Inc.
MONONA, WI. The City of Monona has completed acquisition of five properties bordered by Broadway Avenue, Bridge Road and the Yahara River for a multimillion dollar waterfront development. In addition to the 7.4 acres that will be redeveloped, the Bank of Monona and a yacht club will remain on the property increasing the size of the total project to 10 acres. The City plans to create a vibrant, waterfront riverwalk destination unlike any other in the region. The project will offer public access to the waterfront, and significantly boost the tax base of the community. Mayor Bob Miller expressed the importance of the project to In Business. “Right now, only five slips are public, and there are no pedestrian areas to get to the river,” Miller said. “[For Monona], this could be the equivalent of doing a Monona Terrace, Edgewater, or Judge Doyle Square. This is rare.” He also suggested that the riverwalk project will happen “sooner rather than later.” The City of Monona and Monona’s Community Development Authority worked with Vandewalle & Associates to develop the redevelopment strategies, plans, and vision concept. The team met repeatedly with property owners, and also involved the Wisconsin Department of Natural Resources and the Department of Transportation from the very beginning.